When it comes to education, Indian youngsters are still holding on to what’s traditional option for them and choosing something that seems familiar to them, like choosing CA to ACCA. However, today’s youth are looking for better prospects in their career and what’s better than a lucrative career in leading markets across the globe. ACCA (The Association of Chartered Certified Accountants), which has been responsible is shaping many youth’s career has suddenly looking up in India. Today over 10,000 student in the commerce stream are taking to ACCA fundamental courses to raise in their career. What’s more is that 400-500 students are adding each year. ACCA has also announced a major step forward in shaping the future of accountancy by unveiling major innovations to its Master’s level qualification. The new, ground-breaking design of the qualification draws on an extensive, two-year review and consultation with members, employers and learning providers. On the professional front, according to Khan, 7,400 approved ACCA members are presently employed in leading organisations and banks globally. India has over 1,100 qualified ACCA members and the numbers are slowing gaining number by adding about 100 over the last two years. ACCA membership is not accepted not just in the United Kingdom but also in Australia, New Zealand, Middle East, Singapore, Malaysia, China etc. In April 2016, India chose the path of IFRS (International Financial Reporting Standards) convergence and introduced Ind-AS (Indian Accounting Standards). Ind-AS is modelled along the lines of IFRS, which is internationally accepted accounting standards, and it upgrades India’s accounting standards to an international level. This has created the necessity for a new, modern day accountant who can understand the dynamic nature of Ind-AS and can successfully implement it. 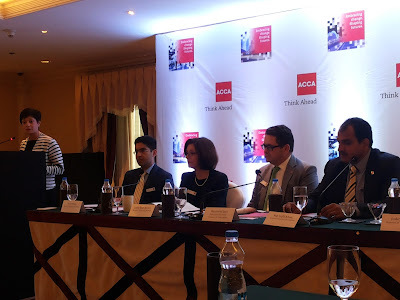 “We’re delivering a qualification that meets the demands of professional accountants in the 21st century, while maintaining the rigorous standards of technical, ethical and professional skills that has established ACCA as the international benchmark for accountancy qualifications,” said Judith Bennett, FEDS (Flexible Exam Delivery Programme) Programme Director, ACCA, at the event.